ITEM #KRESTO: A GREAT INK REMOVER FOR A PEN FANATIC'S HANDS. 8.45 ounces of the best thing I've found to get ink off my hands. An extra heavy duty biodegradable hand cleaning paste with a special solvent to quickly cut through ink and other stains you don't want on your hands. Just squeeze some on, rub it in, and rinse it off. Take a look at the before and after pictures below, taken after an intense night of nib tweaking. ITEM #SILCONE: SILICONE GREASE USED FOR LUBRICATING PISTON SHAFTS AND ANYTHING ELSE NEEDING LUBRICATION AND A SLIGHT AMOUNT OF SEALING ESPECIALLY WHEN THERE IS PLASTIC, HARD RUBBER, or LEATHER INVOLVED. Approx. 5 grams in a syringe with a cap on the nozzle. ITEM #PIPET: 2 ml PIPETTE FOR CONTROLLABLY DISPENSING LIQUIDS The small diameter tip can be made even smaller by holding it over a flame for a few seconds and then stretching it. Great for filling eye dropper filler pens or dropping acetone on replacement Sheaffer Vac Fill rear seals (see tool RZ on the Sheaffer Tools page). We also carry regular old fashioned, rubber and glass eye droppers. Same price, please ask, but (don't plan on using a rubber bulbed eye dropper with acetone). ITEM #HANGING PRES BAR - 3 SIZES: HANGING 3 PIECE PRESSURE BAR FOR PARKER BUTTON FILLERS. 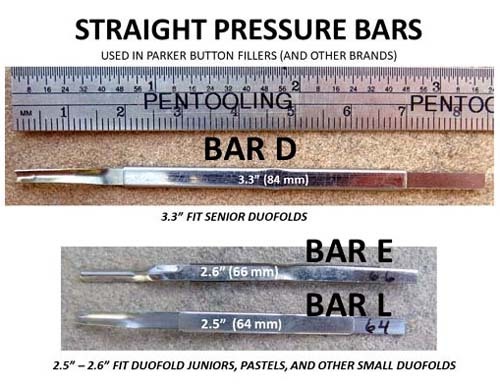 These are reproductions of all three sizes of Parker's hanging pressure bars for its button fillers. 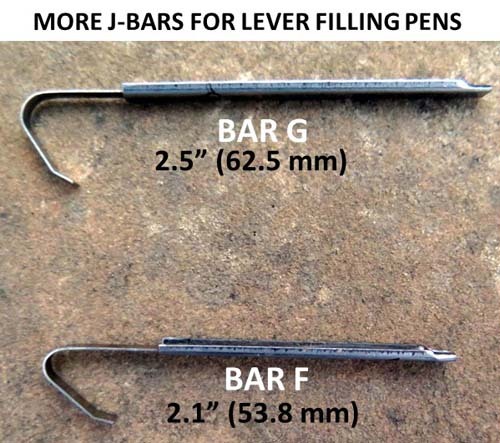 The sizes of pressure bars that a given size of pen uses overlaps a great deal. 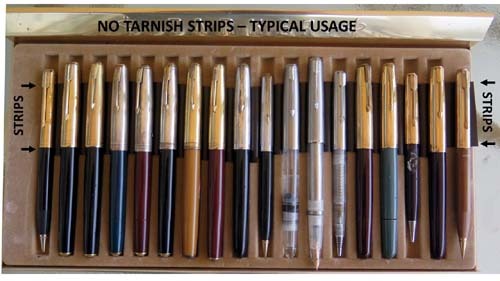 The medium size fits a wide range of fountain pen sizes from Duofold Seniors to small sized Challengers and it was the only size supplied to Parker's repair people in the end. See the second photo below; the numbers on the pens indicate the volume of ink taken in by the pen shown with the medium pressure bar in it. All these are quite riteous volumes of ink for the given pen. For these pressure bars to work, you'll need to be able to pass a No. 12 drill through the hole in the top of the barrel to clean it out and adjust for any shrinkage and crud build up that has occurred over the ages (I find this to be required even when re-using an original Parker 3 piece pressure bar). This type of pressure bar frequently results in less force being required when pushing the fill button down, which greatly alleviates the chances of an accident with an open ink bottle. The drill shown at the bottom of the photo is a no. 12 and is shown as the next item in these listings. These bars won't work in Pastels; there's not enough diameter under the barrel collar for a 3 piece pressure bar to expand in a Pastel. The sizes are shown in the first photo below, and as pointed out above, there is quite an overlap in the sizes that will fit a given size pen. Just try to get the length from the top of the button to the section of the pen and don't exceed it with the pressure bar length. When ordering, specify the size you want as "BAR A", "BAR B" OR "BAR C". 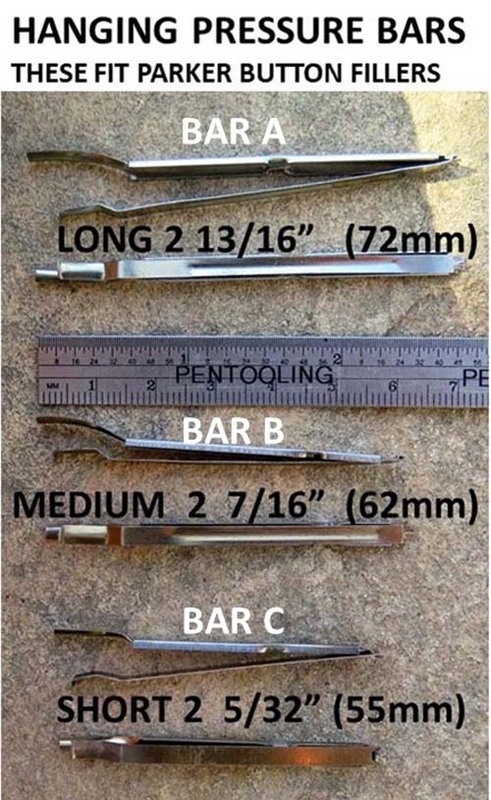 ITEM #12 DRILL: NEEDED TO ASSURE SMOOTH OPERATION OF ABOVE HANGING 3 PIECE PRESSURE BARS (OR ORIGINAL USED 3 PIECE HANGING PRESSURE BARS) IN PARKER BUTTON FILLERS. ITEM #BAR E OR BAR L - STRAIGHT 2 PIECE PRESSURE BARS FOR PARKER BUTTON FILLERS. Long and medium sizes are available as shown in the photo. Stainless steel. SPECIFY THE LENGTH DESIRED WHEN ORDERING. Note: The last photo below illustrates a neat trick taught to me by the late, great Frank Dubiel. It involves lengthening straight pressure bars with a piece of insulation off of a pioece of 12 gage electrical wire. The top end of the pressure bar fits into the piece of insulation which then fits into a Parker button. You then have a longer pressure bar. A piece of a hollow Q-Tip handle also works if you can find one. Note (again): These pressure bars can also be shortened a small amount by removing a small amount of the bottom end, making sure there are no sharp edges on it after you cut it. A file works well here. Also make sure you don't take so much off that it no longer flexes on the bottom end. When ordering, specify the size you want as "BAR D", "BAR E" OR "BAR L". ITEM #SHELLAC: SAC CEMENT For the purpose of securing new sacs to pen sections, shellac is preffered as it does not get very hard, and after it dries, it can be softened with a little heat. Comes in .5 oz (15 ml.) bottle (this is a nail polish sized bottle) with brush in cap. I bought a bottle this size 20 years ago and I'm stil using the same bottle. (5) #14, (15) #16, (20) #18, (10) #20, (10) #15, (20) #17, (10) #19, (10) #22. ITEM #(given below, on left): SACS - I HAVE 4 KINDS: Latex, Silicone, PVC, and bargain latex. The bargain ones are not lower quality, I just have a whole lot of them. Use the item numbers to the left. The sizes are the diameter of the sac in 64ths of an inch; i.e., a size 16 sac is 16/64ths of an inch in diameter. See the Odd Tools page for a sac size gage (D8) and a sac expander (D10) available for sale. S15: SIZE 15 X 3 1/4" LONG; $4 ea. or 3 for $10. S17: SIZE 15 X 3 1/4" LONG; $4 ea. or 3 for $10. S18: SIZE 18 X 3 3/8" LONG; $4 ea. or 3 for $10. STRAIGHT PVC SACS - NOT FOR USE IN CELLULOID or SOFT PLASTIC (NON-ACRYLIC) PENS. SPECIFY DEB, STANDARD, OR OVERSIZED (All 51 vacs use DEB size) Remember to cut total length of Vac diaphragms down to 1 1/16" before installing, or they won't work too well. L15: Size 15 X 3 1/8" long; One to Three: $3 ea. or 4 or more, $2.50 ea. L16: Size 16 X 3 1/8" long; One to Three: $3 ea. or 4 or more, $2.50 ea. L18: Size 18 X 3 1/8" long; One to Three: $3 ea. or 4 or more, $2.50 ea. L20: Size 20 X 3 5/16" long; One to Three: $3 ea. or 4 or more, $2.50 ea. ITEM #AERO STD SAC: NEW PVC SAC FOR PARKER STANDARD SIZED AEROMETRIC FILLING UNITS. Also fit 21 & 41. You may need to trim about 1/8" off the open end for a 41. ITEM #TALC: Use this to treat the outsides of your sacs so they won't stick to parts of the pen that you don't want them sticking to. Also helpful in folding over Vacumatic diaphragms. ITEM #NOTARN: FLEXIBLE TREATED STRIPS TO PREVENT TARNISH ON PRECIOUS METALS. Size is approx. 2" X 6". Ten strips per pack. They change color when they are played out, but I've been using them for about a year now and none have changed color. A typical application is shown below. Lay them underneath or near your pens in a display case. ITEM #AMODEX: INK & STAIN REMOVER. Works on fingers & fabrics. Comes in 2 sizes, 1 oz. & .5oz. the smaller size has a built-in brush and the larger size comes with a small toothbrush. Specify size when ordering. ITEM #61 INK: PARKER INSTANT INK FOR 61 PENS. This was part of the revolutionary goodness inherent in the development of the 61; you didn't need to carry liquid ink around with you, but you COULD always have ink with you if you had water. Just put this capsule on the end of your filling unit, put it in water for 30 seconds, take it off, put your pen back together and you're all set to write like a scribe. ITEM #INKNIX: INKNIX INK REMOVER, 4 oz. PROPAC. Rub a small amount of INKNIX ink remover on your hands without any water. When you see the ink start to dissolve (30 to 60 seconds) add a few drops of water and continue rubbing, adding water little by little until the ink is gone. Rinse and dry hands. INKNIX is recommended for use on hands only. When treating fabric, try first on an inconspicuous area in case a color change may be caused. $16 NO LONGER AVAILABLE; SEE KRESTO, ABOVE. ITEM #AERO SML SAC: NEW PVC SAC FOR PARKER SMALLER SIZED AEROMETRIC FILLING UNITS. Such as 41s and smaller 51s. Please look at the ruler in the picture before buying.